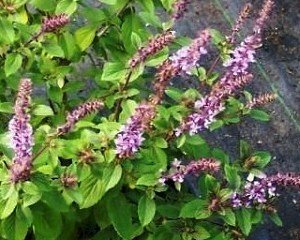 African Blue Basil Live Plant-Beautiful culinary basil variety is at home in the flower garden or the herb garden. This variety features dark purple stems and veining on green leaves and tall purple flower spikes when in bloom. Perennial zones 11+ You will receive One well rooted plants shipped in a 3" nursery container. We ship year round with insulated packaging, however, please keep in mind your zone when ordering plants out of season. The plant you will receive will be well-rooted starter plants shipped in their 3" nursery containers approx. 6" tall. The plants you receive may or may not be in bloom at time of shipment. Plants may be cut back for shipping purposes. Care instructions are included in each shipment and will greatly improve the success you have with your plants. Please contact us if you have any questions or concerns. We appreciate your business. Thank you!